The Bullet flash drive boasts a classic ammo shape and metal casing. Twist off the cap for easy access to the connector port. 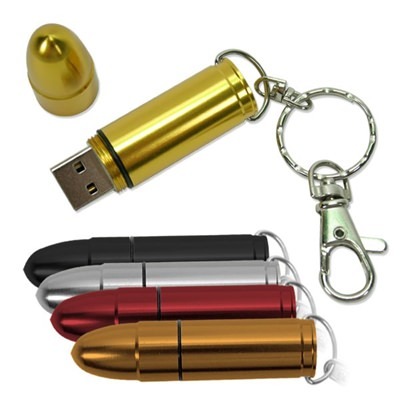 This metal promotional USB drive is compatible with silkscreen printing or laser engraving. It is an ideal USB for marksmen, shooting ranges, outdoor enthusiasts and other gun associations. Aim for high sales numbers with this excellent promotional option. It offers a striking drive (that comes in a multitude of metallic colors) shape that combines advertising and data storage space. You can be assured that your logo will look simply awesome silkscreen printed or laser engraved on the casing. The removable cap protects the port and contributes to the bullet shape.